The 10 Best Ice Skating Rinks in Wisconsin! When the lakes of Wisconsin freeze over, residents come out to play. Despite the frigid temperatures, Wisconsinites make the most out of their winter by heading to a pond or local rink to enjoy some physical activity. Here are the 10 best ice skating rinks in the state! The Pettit National Ice Center is an official U.S. Olympic Ice Center. They offer a speed skating oval and two international-sized hockey rinks. They do offer public skating hours at a reasonable price. Skate for free when you bring your own skates at Slice of Ice in Red Arrow Park, Milwaukee. Slice of Ice was voted the “Best Place for Skating in Milwaukee” so you know it’s favored by Wisconsinites. Heat up at their Warming House, which offers ice rentals, Starbucks coffee, lockers, and snacks. Tenney Park in Madison is a popular place for ice skaters in the area. Local news generally makes it known when the lagoon is ready for recreational activities. Enjoy evening lights and free ice-skating throughout the season. Warming house, concessions, and skate rentals available on the weekends. The Chip Wulff Memorial Pond in Winter Park is the perfect place to do some ice-skating in northern Wisconsin. Skate rentals are completely free and they recently added a well next to the pond for seamless resurfacing of the ice. Poppy Waterman Ice Area has rink rental options as well as specific public skate dates and times. They have a full-sized NHL rink that is used for recreational games of every level. Every Sunday from 6-8 p.m. the Chippewa Area Ice Arena invites its residents the opportunity of free open skate. Skates are available for a small rental fee of $3 and concessions are available for food and drink purchase. Check out the Chippewa Area Ice Arena located in Chippewa Falls, Wisconsin. The plaza at the Edgewater’s Ice Rink is a popular place to be when it’s winter in Madison. The Edgewater Ice Rink rents out skates and has a small café for skaters to purchase food and drinks. 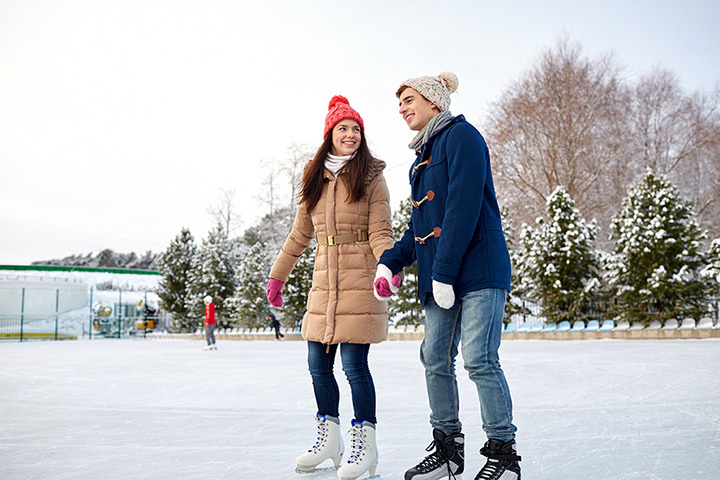 Although the rink is small there is so much to do at the Edgewater—why not make a night of it? The Superior Ice Rink is a great rink for those looking for additional ice time. Rent out the facility or pay $5 for their public skate Wednesday afternoons. Superior Ice Rink takes pride in their clean and up-to-date facilities. Unlike some of the ice rinks in the area Superior Ice Rinks stay open throughout the year. The Janesville Ice Arena is open year-round for recreational skating. The public skate days and times change from month to month. In addition, there are open hockey times for both youth and adults to get their hockey fix in if they aren’t looking to commit to a league. Appleton family Ice Center is the Fox Valley’s choice for ice-skating. Open skate is available for $5 with the option of skate rentals for and additional $3. Rent out the rink for parties and special events. Open hockey times are also available as well as skate classes.